It was November 2012 in a packed lobby of the Pope Convocation Center when Athletic Director Bob Roller announced the hiring of Carolina Panthers legend Mike Minter as the new head coach of a floundering football program that ranked among the worst in all of Division I. “I am convinced that Campbell University and Camel Football is about to experience a transformational change,” Roller said as he introduced his new coach. Roller, Minter and President J. Bradley Creed stood before another large crowd in November 2016 (this time in the convocation center’s arena to make room for a giant inflatable helmet and pep band) to announce Campbell’s jump to scholarship football and its inclusion in the Big South Conference — both beginning in 2018. Standing in front of actual helmets bearing the Camel and Big South logos, Creed broke the news, citing a unanimous vote for the University’s Board of Trustees. But it was Roller and Minter who reveled in the announcement, the latter recalling the process of taking over a 1-10 team and slowly building toward respectability in the FCS. It will start in August 2018 when Campbell becomes the seventh football team in the Big South Conference, joining Liberty, Charleston Southern, Gardner-Webb, Presbyterian and football-only Big South members Kennesaw State (Georgia) and Monmouth (New Jersey). Aside from Monmouth, all in-conference games will be regional, a stark contrast from current Pioneer Football League games played in California, New York, Florida, Ohio, Iowa and Indiana. The move to the Big South also guarantees tougher competition for a program with just one winning season since returning to the gridiron in 2008 after a 50-year absence. In the non-scholarship Pioneer League, Campbell competed against Division I schools while using the financial legislation of the non-scholarship Division III to govern membership. Over the last eight years, Campbell football players couldn’t sign official “letters of intent” and receive financial aid solely because they played football. Big South Commissioner Kyle Kallander said the league — which is home to every other Campbell sports program aside from swimming and wrestling — had been courting Campbell football since 2009. All along, the league said the program would need to add scholarships to seal the deal. With that decision approved, Kallander said bringing in Campbell was a no-brainer. Kallander also pointed to Campbell’s attendance figures for 2016 — figures that rank the school with FBS powerhouses like Ohio State, Oklahoma and Nebraska when it comes to total attendance over stadium capacity. 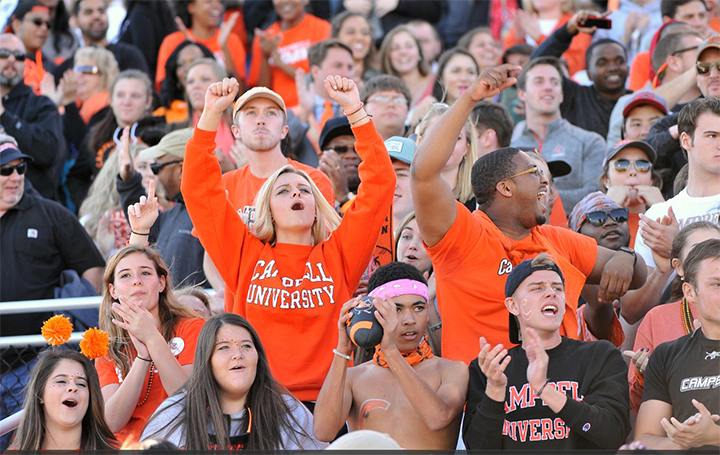 In its six home games last fall, Campbell football drew a total of 33,138 fans, an average of 5,523 per game. By drawing 101 percent over its capacity of 5,500, Barker-Lane Stadium ranked in the Top 10 in the nation in all Division I football — both the FCS and FBS — in attendance over capacity. Bigger programs will mean a bigger stage — something that excites Campbell’s underclassmen who will be juniors and seniors when 2018 rolls around. Big South football teams have made three consecutive quarterfinal appearances in the FCS Playoffs, and recorded multiple postseason bids three times since the league first received an automatic bid in 2010. Aaron Blockmon, the redshirt sophomore big-play threat who leads the Camels with 877 yards receiving and 9 touchdowns, sees the move as putting him and his teammates one step closer to a career in the pros. The Camels have placed two seniors from a year ago on NFL rosters, with defensive tackle Greg Milhouse (New York Giants) and long snapper Danny Dillon (Arizona Cardinals) both signing contracts prior to the 2016 season. 7: When Campbell moves up to the Big South Conference for the 2018 football season, Liberty University will have already moved on to the Football Bowl Subdivision as an independent. But joining Campbell in 2019 will be the University of North Alabama, a Division II football powerhouse with three national titles in the 90s and 11 consecutive playoff appearances since 2005. The conference will be seven strong in 2019, with Campbell and North Alabama joining football-only members Kennesaw State and Monmouth and mainstays Charleston Southern, Gardner-Webb and Monmouth. 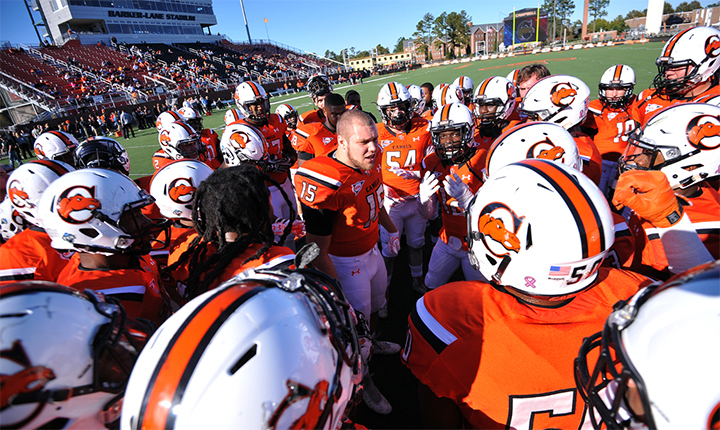 10: Next fall, Campbell’s final season as a non-scholarship football program, will mark the 10th season since the Camels’ return to the gridiron after an over 50-year absence. Campbell has a combined record of 32-68 since its return, but nearly half of those wins (15) have come in the last three seasons. The squad’s best year was 2011 when it went 6-5 for its first and only winning season. The Camels finished the 2016 season 5-5, with its game against Jacksonville canceled because of Hurricane Matthew. 63: When Campbell becomes a scholarship football program in 2018, it will be eligible for 63 full-ride football scholarships on its roster. No more than 30 incoming players each year are eligible for the financial aid. According to NCAA rules, scholarships at Football Championship Subdivision (FCS) schools can be full or partial rides. The 63 grants can be divided up into half- or quarter-scholarships, with no more than 85 players receiving any type of aid (this allows FCS schools to fill out their rosters). The difference in FCS and Football Bowl Subdivision (FBS) schools is the number of full scholarships — FBS schools can have 85 full-ride athletes and cannot split them up. 6,673: Aside from facilities and overall ability, one of the big reasons Campbell was able to make the jump to scholarship football was attendance. The Big South Conference is well aware that Campbell drew a school-record 6,673 fans at Barker-Lane Stadium on Oct. 22, for the 2016 Homecoming game against Stetson. In fact, when it enters the Big South in 2018, Campbell’s current average attendance for football games would rank second in the conference behind Kennesaw State (Liberty draws more as well, but is leaving for the FBS). Campbell’s average attendance in 2016 nearly doubled the average for Big South schools Presbyterian, Monmouth and Charleston Southern.